Who doesn't love a good Asian-style noodle soup? Since I first tired pho, I've been obsessed. I have rarely met an Asian soup I don't love. I make my own pho at home as well as my own ramen noodle inspired bowls. But a few weeks back I came across something on Pinterest called "Chinese Hot Pots." I had to give it a try. When I tried to the recipe, I wasn't too impressed, the broth was too vinegary and the vegetables too underdone. So I did what any bossy pants mama would do: I made it my own! The basic concept with the hot pots is that you make a delicious broth you ladle over the raw veggies and they cook in the hot broth for a few moments. This is a great concept, but there are also some veggies I prefer boiled just a little. Maybe this makes me a hot pot blasphemer, and I'm comfortable with that. 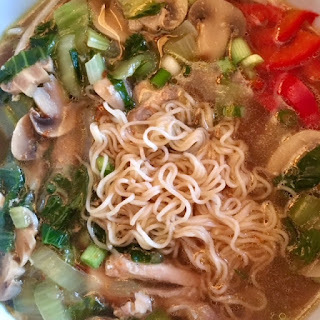 In my version of the hot pots, I cook the baby bok choy and the mushrooms a bit in the broth, and then I add that to some raw veggies laid out in the bowl. It's the best of both worlds! I feel like this dish would be the outcome if pho and ramen had a baby. Doesn't that sound amazing?! After posting some shots to my Instagram account (by the way, you can follow me on Insta @bossy.italian.wife), I had a few requests to share the recipe. As they say, "sharing is caring!" ALSO, it is of note that this dish can be tailored to anyone's dietary needs. It's naturally dairy free, but could also be converted to be vegetarian/vegan. And the vegetables? Merely suggestions! You can add or subtract any of the vegetables you like best. Get creative! That's what cooking is all about--an expression of creativity. What you will ultimately end up with here is truly a beautiful bowl of soup, perfect for Spring when it's sometimes still cold and you want a warming bowl of soup, but with all the loveliness of fresh, colorful vegetables. It's basically Spring in a bowl. Mmmmmm. Chinese noodles (your choice) I used thin, wheat noodles that reminded me of ramen noodles. Add star anise, garlic, ginger, soy, chicken and pork bullion, and sesame oil. Bring to a boil and allow to cook about 15-20 minutes. Taste and adjust seasonings, if necessary. You may want a little more chicken or pork flavor, or more soy sauce, depending on your personal tastes. Meanwhile, cook noodles and drain. Set up bowls with cooked noodles, chicken, sprouts, green onion, and bell peppers. When broth is done, remove star anise pods. Add sliced mushrooms and bok choy to broth and allow that to boil about 5 minutes. Ladle hot broth into bowls and serve with hoisin and hot sauce!